A processing method which takes oxygen or nitrogen as working gas, make use of high-temperature plasma arc heat to melt and evaporate the incision of the metal part and by means of the momentum of high-speed plasma flow to remove molten metal in order to form slotting seam. The laser beam which generated by laser device transmitted through a series of the reflector, then focus on the workpiece surface by focus lens and produce local heat at the focal point, to cause the hot spot of the workpiece to melt or vaporize to form a slot. At the same time, the auxiliary gas is used in the cutting process to blow out the slag from the slot and finally achieve the purpose of processing. Plasma cutting is suitable for cutting all kinds of metal materials. It is mainly used to cut the medium thickness plate. The advantage is fast cutting speed, narrow cutting slots, small heat affected area, small deformation, low operation cost. The disadvantage is that there is 0.5-1.5°angle at the vertical cross section and hardening incision. Laser cutting is mainly used to cut medium thin plate, and the cutting materials are in very wide range (metal, non-metal, ceramic, glass, etc.). Because the laser has the characteristics of high direction, high brightness and high intensity, the laser cutting speed is fast, the machining precision is high, and the cutting seam is very narrow, and there is no need for subsequent processing. 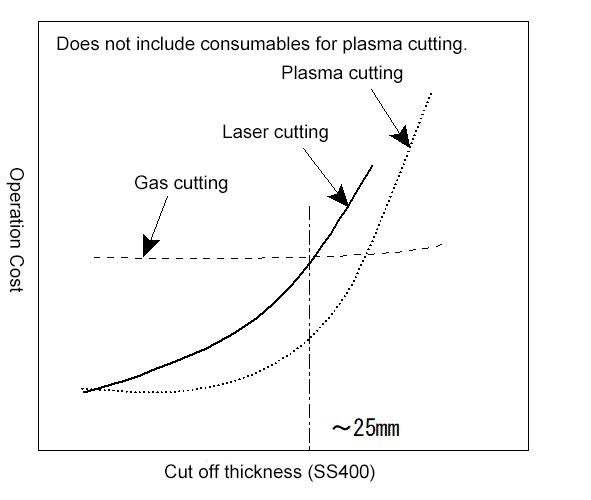 In terms of cost, plasma cutting is much cheaper than laser cutting. ① Small cut slots, the cutting surface can be used directly for welding without grinding. 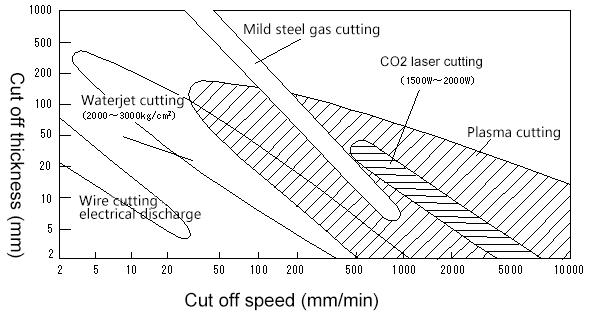 ② Fast cutting speed: it can reach 10m/min for the thin sheet which is much faster than plasma cutting. ③ Good cutting quality: Small deformation, low surface roughness, low oblique cutting edge. ④ High precision: positioning accuracy can reach 0.05mm and re-positioning accuracy can reach 0.02mm. ⑤ Wide cutting materials: in addition to cutting metal, it can also cut wood, plastic, rubber, PVC, leather, textiles and organic glass etc. High cost ranks first. Both initial investment and later maintenance require higher costs. At present, the laser cutting for the thin plate is more cost-effective. However, when cut the thick plate, the efficiency is low, so the laser cutting is not suitable unless the quality requirement is high. In the process of cutting medium thick plate, it can achieve very high cutting speed, much higher than laser cutting and flame cutting. The initial equipment investment is lower than the laser, and the later maintenance cost is also much lower. ① Poor perpendicularity of cutting surface: on the side of the cutting surface there will be a large oblique cutting edge, and the perpendicularity will be poor. ② Produce more cutting slag: the cutting slag will be produced during the cutting process at the bottom of the cutting surface. In order not to affect the quality of the post-process, this slag must be removed by grinding, which also increases the labor cost. ③ Generate harmful gases and arc light: the principle of plasma cutting determines the harmful dust and arc light will be produced during the cutting process. However, underwater plasma cutting is also been used to avoid this defect. ④ In the later period, it will consume more cutting nozzle, and the cost is very high. The laser cutting machine does not damage the workpiece, while the plasma cutting machine has damage to the plate. Especially during the cutting process, when the torch and nozzle of plasma cutting machine have problems, it will cause obvious defects to the plate. Because the laser beam is focused into tiny light points, so the cutting slot of the laser cutting machine is narrow. 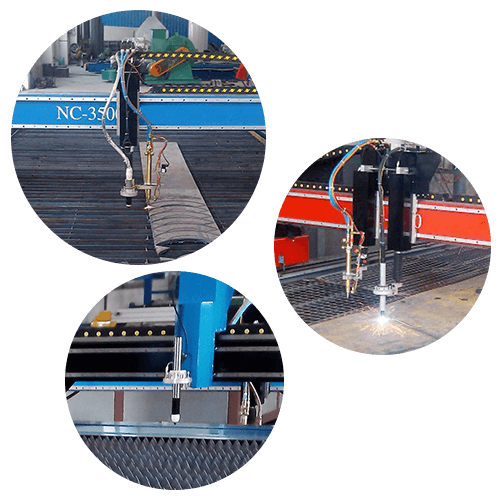 The cutting slot of plasma cutting machine is slightly larger than that of the laser cutting machine. Laser cutting machine has faster-cutting speed: the speed can reach 10m/min of laser cutter which is much faster than the plasma cutter. The cutting surface of the laser cutting machine is smooth, without burr, with good cutting quality, is a non-contact cutting. The heat affected area of cutting edge is very small, and there is almost no thermal deformation of the workpiece, which completely avoids turned-down edge when punching and shearing the material. Generally, the cutting edge does not need secondary processing, but the plate thickness is limited and the processing cost is high. However, the plasma cutting machine can cut 6-40mm steel plate with various model and power. The processing cost is relatively small. 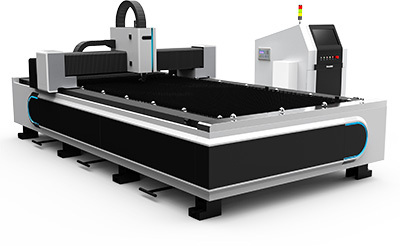 The laser cutter has high precision: the positioning accuracy of the laser cutting machine is 0.05mm, and the re-positioning accuracy is 0.02mm, but require higher the working environment condition. Although the machining accuracy of plasma cutting machine is not equal to that of the laser cutting machine, it has a low requirement for the working environment and strong mobility, and it has a wide range of cutting and requires lower skills for operators than that of the laser cutting machine. The cutting precision is higher, the speed is fast, the sheet deformation is small, suitable for the parts with a complicated shape, but the cutting thickness is limited. In general, for the plate under 8mm, the laser cutting machine is been used for blanking of the workpiece which requires high precision, because the blanking cost is higher, and the cleanliness of the plate is also required. Wide cutting range, all metal plates can be cut; fast cutting speed and high efficiency; cutting precision and fineness are higher than NC oxyfuel cutting. The disadvantage is cutting thick plate, especially for the 20mm+ plate, will be difficult. At this time, higher plasma power will be needed, which definitely will increase the equipment costs. Nonmetal: ceramics, plastics, rubber, wood, leather, cloth, paper, film etc. High alloy steel such as carbon steel, low alloy steel and stainless steel. Other non-metallic high viscosity materials (rubber, film, etc. ), brittle materials (ceramics, glass, etc.) cannot be processed. Disadvantage ・With the increase of plate thickness, the hole drilling time increases sharply. ・The state of the material surface determines the processing quality. ・Wide incision and big deformation. ・The width and shape of the incision are changed due to the consumption of the nozzle and electrode. ・Can not cut easily magnetized material. 4．The relationship between plate thickness and cost. 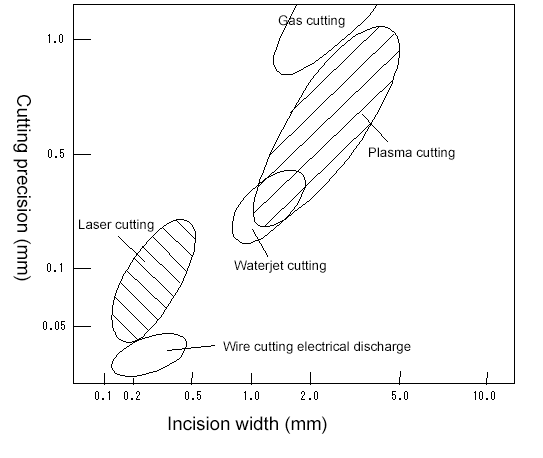 5．The incision width and cutting precision of various cutting methods. 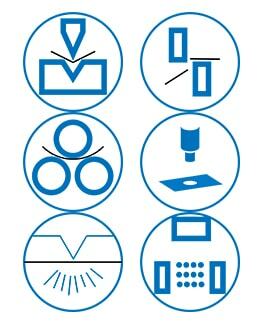 6．Cutting conditions of various cutting methods. Great, thanks. I’m in sheet metal industry for over 20 years, started with tin snips in one hand and a hammer in other. Moved to punching machines than to laser. We have came long way since then as industry. Have some experience with water jet cutting along the way, but not much with plasma. Fast and efficient way of cutting metal.